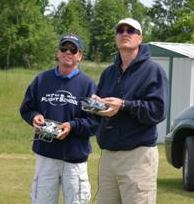 Home » Industry News » 1st U.S. R/C Flight School trains its 1600th student! Here’s his report…. 1st U.S. R/C Flight School trains its 1600th student! Here’s his report…. 4. Do not fix it … as well as reflecting on the flight while on the ground and not going 80 mph. Your teaching techniques are solid, very efficient and completed in a very relaxing environment. The weather was perfect. Our ability to deal with the wind on the last day was a testament to the skills we learned. I noticed on the drive home from the school on the last day, I could feel the wind gusts pushing my Jeep, and to think we were flying in it. Definitely a gold star there!!! Since my return, I reviewed and reduced the throws and expo down as you recommended and my flying is now definitely cleaner and more precise, and the problem I had with trimming for straight and level flight is gone. It now seems that I have a lot more time to complete the maneuvers. I think this is due to proper setup and what you called “consolidation” of the teachings from your course. Everything now seems much easier and natural. I’m now able to string 10+ maneuvers together without stopping to realign my parallel lines all by ensuring my wings are level. I feel very connected to the flight and the model. I had a similar experience with the simulator … again by reducing the throws and ensuring the wings are level, I’m having to spend far less time on maintaining the flight alignment, and also feel more connected to the flight. I am very much looking forward to this flying season and my newly acquired knowledge and skills … it has really improved the quality of my flying in a lot less time. Clearly the best way to begin the season will be with your Aerobatic course and I am very much looking forward to next coaching session of solid instruction and enjoyment next year!! !